Where do we spend our attention? 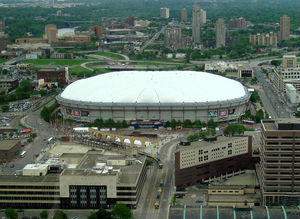 I’ve long since become utterly bored with news reports about a new football stadium to replace the Metrodome. They’ve been going on for years. High-level politicians and business people from at least two counties and several cities have put forward proposals. Sites have been scouted out and architectural possibilities sketched out. Governor Dayton and other public officials have spent hours in meetings, on phone calls, and pondering the subject. Who paid for all those drawings, all that staff time, the transportation to the sites? If we recorded the hourly wage of the people involved in these talks, we’ve probably already spent over a million dollars just to develop dozens of ideas for a stadium project. I can’t think of any other topic that has received so much attention. Not poverty. Not our schools or the achievement gap. Not jobs. What are we getting for it? Research shows that football revenue is not new money; consumers aren’t spending more than they would have without a football game. They would have gone out to eat in their neighborhood and attended local entertainment events. Football transfers that spending to the area near the stadium. The gains to those businesses will be offset by losses to other businesses around the state. There’s little or no overall income increase for a stadium, and it works to the detriment the economies of smaller suburbs and towns. But there is another cost: the cost of our focus and attention. We’ve poured out our greatest effort and tasked our most creative minds simply to find a venue for 16 to 20 football games a year. We’ve focused the public’s attention repeatedly with talk of tax hikes and highway diversions for each of the plans – even when we won’t consider adding to our fees or taxes for programs or projects that would benefit a much larger number of people throughout the state. Imagine how much progress we might have made on creative plans to jump start small businesses to create jobs, or innovative ways to deal with the abundance of foreclosed homes, or projects to revitalize schools if we had picked just one of those problems, developed a public-private dialogue and devoted as much creativity and energy, as many resources, and the efforts of as many different officials and civic leaders to it. Let’s pay our attention to the things that matter most. Great article! I get tired of hearing so much talk about sport in general, but there’s something wrong when we spend that much money on something so frivolous when there are so many in need. Someone in a meeting mentioned how difficult it was to get even 10 minutes with Governor Dayton. On the way home, I heard that he’d held yet another discussion about the various proposals for a football stadium. That juxtaposition sparked me to think about attention – and time – as something that is allocated and spent just as much as our state budget.